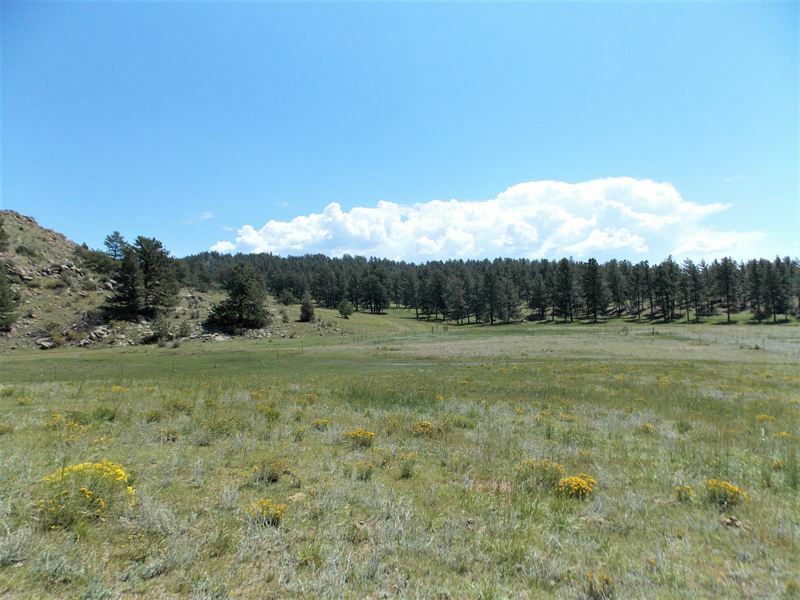 Teller Park Ranch - Parcel 3 Teller Park Ranch - Parcel 3 is a 156-Acre +/- site that contains a good mixture of open valley meadows, rock outcroppings, creek beds, ponds and treed hillsides. The elevation of the parcel generally ranges from 8,400 to 8,600 feet. Elevated areas provide outstanding views of the Sangre De Cristo range to the south. There are several ideal building sites wherein a structure could be placed in optimizing surrounding views, overlooking pasture areas, or simply for privacy. There are good stands of aspen and pine trees along with seasonal flow creeks situated throughout. Water is provided by a developed spring with a stock tank and 2 seasonal ponds that collect winter run-off and spring/summer rains. Elk, mule deer, black bear, mountain lion and turkey are common inhabitants. The parcel is located in unit 581, an oter unit for archery elk and 2nd & 3rd rifle seasons. Parcel 3 is situated in a draw area for mule deer. Per the attached survey and Park County Assessor records, Parcel 3 is labeled as Park County Parcel B and is currently combined under one tax schedule number with Parcel A 105-Acres +/-. Therefore, Parcel 3 is currently considered conceptual and would require the assigning of a dedicated parcel number by Park County along with a lot line adjustment through that adjacent portion contained in Teller County. The larger Teller Park Ranch at 570 +/- acres Parcels 1, 2 & 3 is available for purchase for Over 36,000-Acres just to the north are under the ownership or management of the Colorado Outdoor Education Center, the National Forest Service and the Florissant Fossil Beds National Monument, providing both buffers and public land accessibility. The property is also located just south of the Florissant Fossil Beds National Monument a 6,000-Acre attraction containing a visitor center, walking trail and other exhibits. Mueller State Park is also in close proximity and serves as an additional public recreational amenity. There is excellent fishing within one hour of the ranch with good stretches of the South Platte and the Arkansas Rivers being open to the public. There are also nearby lakes such as Eleven Mile, Spinney, Tarryall and Antero Reservoirs in South Park. These lakes hold some of the largest trout in the state. The parcel is approximately one-to-two hour's drive on good roads to the Monarch, Cooper and Summit County Ski Resorts. Woodland Park is the nearest sizable city with a full-time population of about 8,000 residents and provides primary retail and lodging services. Florissant is a quaint town located just to the north and containing basic services. The historic mining town of Cripple Creek is located an equal distance to the south and provides the nearest entertainment venue in the form of 12 casinos and various historic exhibits and museums.